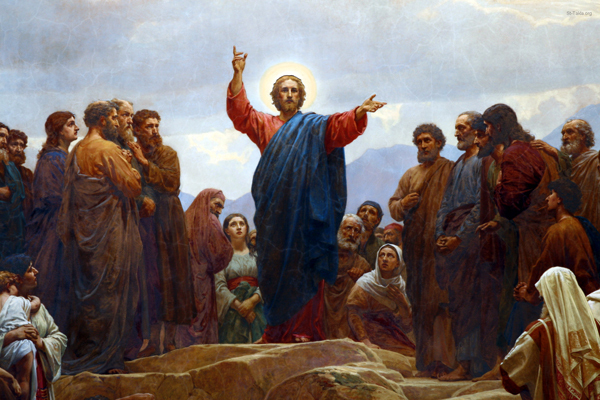 What is the Good News of the Gospel as Taught by Jesus of Nazareth? This question is harder than I expected. There is the Sunday school answer, that Jesus died to save us from sin and death. I hope this is true. I’m having trouble with it in my day to day my life. I seem to make the same mistakes over and over again. Those who have to live with me are well aware and have mostly learned to worked around them. There have been consequences but most people are gracious and forgiving or else they keep their distance. I’m also very limited, though I’m not sure that is the same thing. It’s possible Jesus could eventually save me from these sins, but I’ve mostly tried to learn how to work with more compassion within them. This kind of living in sin doesn’t seem to be that scriptural, but it’s the only way I know how to get up in the morning, to live with my regrets and to face a future knowing more mistakes are coming. I know I’m going to die. It could be soon, but it feels like I’m going to live forever. My dad’s death is the closest thing to it I’ve come, almost seven years ago now. It was a pretty close encounter. At the time, my dad was living in a group home. Previously he had suffered from a pretty serious stroke, had spent weeks in a nursing home trying to recover before graduating to a group home. I still had hopes he was immortal, thinking he would eventually recover to where he was before. He made progress, but there were a lot of setbacks, repeated trips to the emergency room. He broke a hip, he required a pacemaker. I was the decision maker everytime, or more accurately, they made me think so, couching my decision within a framework where he either would die or they would intervene. When he finally collapsed for the final time in the group home, I was the first one called. I rushed to the hospital and found his lifeless body in the hospital bed surrounded by doctors trying to resuscitate him. I held his hand for a moment before telling the doctors it was ok to stop trying. These years later, he still feels very much like my dad. I still remember his deep love he expressed in a number of ways when he raised me. That love very much is present now. I hope I’ll see him again but I can’t even fathom what that would be like now, his dead body decayed in the earth. What’s front and center for me right now, isn’t sin or death, it’s connection and belonging. I think more about my mom now than my dad. She lives alone, with few friends but a very caring ward. I’m her only close relative nearby. I know she feels lonely often. She calls me often, usually confirming when I’ll be there again. It seems like loneliness is often the biggest challenge of old age. Or maybe of any age. I think most people just want to be heard, understood, loved and cared for. They want to feel like they belong and have a purpose in their life. The saddest times in my life were always those times when I felt disconnected, lost or alone. My biggest worry now is that I’ll be disconnected, cast out, forgotten and left alone. What does this have to do with the Good News of the gospel of Jesus Christ? Jesus was born in a cave, grew up obscure and uneducated and disconnected from power. His ministry focused on those even more marginalized then him – the sinners, the affirmed, the sick, and the poor. When he lost his temper, it was always toward the powerful. His central message was love, a kind of love so radical that it extended even to his enemies, even, in his case, to the people who were crucifying him. I think this is the good news of Jesus of Nazareth. This is something I can sink my teeth into in my day to day life- that we are loved, that we belong, that we matter, irrespective of accomplishments, positions, or talents And that as I try to live the good news, it is my job to help others feel like they belong as well. And truly embodying the good news means I should frame everything I do into helping others feel this deeply, either directly or indirectly. There’s been a lot of talk among “progressive Mormons” about how to walk the path known as “Middle Way Mormonism”. Here is a recent article on the topic. There are other words for it, New Order Mormon, for example. Cafeteria Mormonism is sometimes used to describe this way of being in the church, somewhat pejoratively. Some of those who have already left the church believe those that self-identify as “Middle Way Mormons” are merely there temporarily, before they eventually leave the church. PBS: Our film [features] a very strong statement you made. You are talking about the foundational story of Mormonism and why it must be taken literally, that Joseph Smith had the vision he described and obtained the plates the way he did. You said there is no middle ground. Other churches are approaching their foundational stories and turning them into metaphor at times and going perhaps for the essence of the meaning. But that isn’t true for you or for this church. I’m wondering if you can develop that idea: Why can’t there be a middle ground in the way those foundational stories are understood? President Hinckley: Well, it’s either true or false. If it’s false, we’re engaged in a great fraud. If it’s true, it’s the most important thing in the world. Now, that’s the whole picture. It is either right or wrong, true or false, fraudulent or true. And that’s exactly where we stand, with a conviction in our hearts that it is true: that Joseph went into the [Sacred] Grove; that he saw the Father and the Son; that he talked with them; that Moroni came; that the Book of Mormon was translated from the plates; that the priesthood was restored by those who held it anciently. That’s our claim. That’s where we stand, and that’s where we fall, if we fall. But we don’t. We just stand secure in that faith. Mark Crego, in a recent Sunstone presentation, describes being a Middle way Mormon in exactly these terms. Certainty has a definite appeal. There’s something satisfying about being part of a faction or tribe. We need each other and being in relationships is the only way to survive and thrive the brutality of existence. The US prison system’s use of solitary confinement is known as torture for a reason. However, drawing strength from our relationships quickly devolves into cliques at a small scale or into tribalism at a larger scale whenever we elevate dogma or define hard borders between us and the other. Walking in the middle way requires courage, courage to include and accept, to listen and to recalibrate. It requires a willingness to say or do things that might be unacceptable to one’s peer group. It requires a balance between individualism and loyalty to our groups. Middle Way Mormons are not afraid of truth, no matter the source. This means finding a balance between religious faith and a devotion to empirical evidence. Being willing to evolve and adapt one’s view of things as one encounters new evidence. Listen to this brilliant interview with David Bokovy, here and here. Bokovoy’s academic background is in Biblical studies. Through his deep study of the scripture, especially his use of “higher criticism” of the scripture, which means reading the scripture from the point of view of the writer, trying to take seriously what the book is actually saying, treating the scripture as it partially is, as an historical document. Doing this, Bokovoy found scripture filled with anachronisms, contradictions, and other problems. He also found scripture filled with beauty, depth and writings from a people in a deep wrestle with big issues. This deep encounter with scripture did not destroy his faith, but rather forced him to re-calibrate his understanding. It moved him into greater depths of understanding. On the cusp of entering this course of study, his advisors told him to avoid Biblical studies because no one survives such a study with their testimony in tact. Bokovoy further claims that most evangelical leaders pursues academic studies in topics tangential to Biblical studies so they don’t have to confront the problems head on. This kind of testimony preserving avoidance is not part of the middle way. It devalues a testimony that cannot survive deep study of scripture. What does a testimony start to look like when forced to walk the middle way? Adam Miller gets to the heart of a testimony in his book, Rube Goldberg Machines. There is an irony, then, to the kind of certainty proper to the sincere clarity of a testimony. The certainty of a testimony depends on purifying it of the actual in favor of the previously impossible. Against the tyranny of a world broken by sin and sorrow, a testimony must unwaveringly maintain the certainty of its own foundationless restoration of possibility. A testimony, in order to be true to its unmitigated reliance upon the Atonement of Jesus Christ, must accept the indefensible weakness imposed upon it by its own boundless certainty. Find the middle way, being able to absorb empiricism while preserving faith, requires a recalibration of what it means to have faith. It requires a certain kind of purifying, distillation process of what it means to have a testimony. We must remove aspects of a testimony that do not belong there. How can I have a testimony of Joseph Smith’s near infallibility when I deeply struggle with polygamy. “Who would be more horrified by the idea of people having a testimony of Joseph Smith than Joseph Smith?” asks Adam Miller in Rube Goldberg Machines. How can I have a testimony in the Book of Mormon’s historicity? This is a historical, scientific claim that must live or die empirically. And even here, testimony is not empirical, rather it’s transcendent. Atonement and resurrection deal with fundamentally religious concerns – death, dying, sin, mercy and grace. Being forgiven even when we don’t always deserve to be. Being transformed when our best efforts fall to be good fall short, time and again. I don’t think walking the middle way is being luke-warm, complacent, or avoiding difficult doctrine. It requires a constant balance, being willing to wrestle with difficult ideas, having the courage to face problems head on, being as honest as we possibly can, being true to our inner-callings, while being humble enough to listen to mentors, teachers and those with earned authority. Being willing, at times, to speaking truth to power. Perhaps it’s impossible to walk the middle way completely. It takes time and maturity and many mistakes and skinned knees along the way. We can work our whole lives to purify our testimony, to rid ourselves of our prejudices, to be true to our inner voice, to forgive others, to love our enemies, to know when to speak up and to know when to forgive quietly graciously. Finding the Middle Way is difficult and it looks different for everyone. It can be a lonely and isolating experience at times. But I think we’re all called into it. Our churches and institutions, at their best, are structured to support us in our journey along the Middle Way. The church is built for us, not us for the church.